In this digital era, every business needs to establish a foothold among its customers. In order to achieve this, business owners actively promote their products and services. Apart from all the marketing strategies that are implemented by them, digital marketing has its own importance. 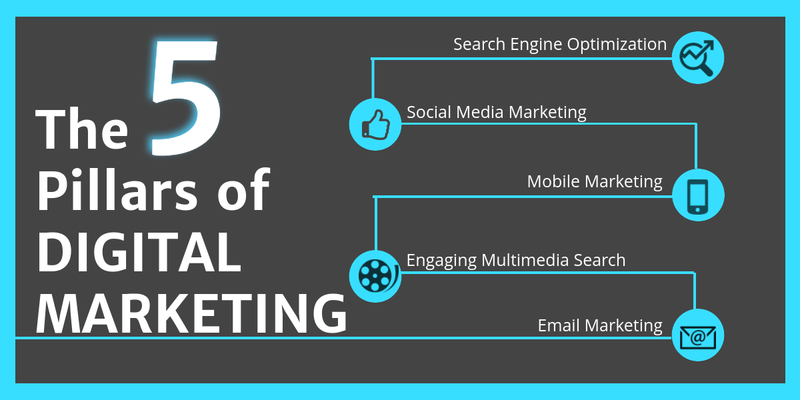 In this article, we are going to showcase the 5 pillars of digital marketing. These are considered as fundamentals for creating your online marketing campaign. The importance of Search Engine Optimization can never be neglected in digital marketing. When you optimize your business website according to the search engine guidelines you will be able to garner authority and trust of your visitors. In SEO, Content is one of the best ways to keep your visitors engaged for a longer time on your website. There are various ways in which you can present your content in front of your audience. Some of the commonly used formats are blogs, slideshows, webinars and even by conducting conferences. You can hire any SEO Services in Australia to rank your website higher on the search engine results. Social media has become a pretty common term now. All the different platforms that come under the social media are an important part of your online marketing strategy. This is because most of your customers spend a lot of their time using social media. With the help of social media marketing, you will be able to target your customers and share your content to only those who matter. In recent years, mobile marketing has been on a rise and it will only see a further upward inclination. Mobile marketing can be done in the form of mobile apps, mobile search and mobile websites. Mobiles have even moved ahead of traditional devices like the laptops and desktops as the preferred device. Mobile phones have revolutionized the entire field and have become an important component of digital marketing. The main reason for its popularity and rise is the utility and ease that it offers to the end users. Gone are the days when you would just get thousands of pages as a search result for your query on search engines. Modern day Internet searches have become very intelligent. These intelligent multimedia search will enable you to search for graphics, animation, video by using some basic commands. Most of the search engine are trying to implement these search options so that the users are able to get a more customized result. Email marketing has stood its ground as the most popular medium of online marketing. Most of the businesses rely heavily on this platform and don’t shy away from investing money in it. By having an effective email marketing your business will grow consistently and generate leads. The popular social media platforms like Facebook and LinkedIn also have email integrated into them in the form of messaging. In order to implement digital marketing in an effective way, it is necessary that you include the above-mentioned pillars in your marketing campaign. Even if you are not able to include all the pillars you must try to integrate some of them. As competition has skyrocketed in businesses of every genre it is your responsibility to make use of these amazing strategies. These will help you in setting your business apart from your competitors and make a mark for yourself.